If your tooth sustains damage that compromises its structure — typically through decay or trauma — you have several options depending on the extent of the damage: One of them is a crown. This method saves the tooth and its root and completely conceals the visible portion of the tooth, or crown, under a natural-looking cap made to mimic as closely as possible the size, shape and color of the original tooth. Crowns also hide imperfections in the original tooth like discoloration, chipping, fractures, excessive wear (from bruxism, or tooth grinding, for example), or abnormalities in the way the tooth formed. And they’re used following root canal treatments, which treat infected pulp at the center (canal) of a tooth root by removing the pulp and replacing it with an inert, rubber-like material. Saving the natural tooth has long been the goal of dentistry because normal micromovements of the tooth root, which is suspended in its jawbone socket by elastic ligaments, stimulate the surrounding bone to rejuvenate. Without that stimulation, the bone continues to lose old cells, but no longer replaces them. 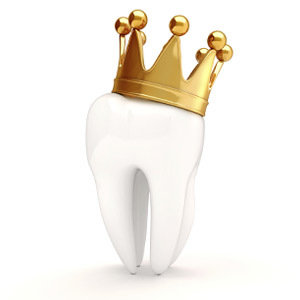 Crowns are also designed to restore tooth function. The function and location of the damaged tooth can determine what material the crown will be made of. If the damaged tooth is clearly visible when you smile, porcelain, the most realistic-looking material, is almost always used. If the tooth receives significant bite force, a stronger material is considered — either, a gold/porcelain combination, or a high-strength ceramic. If you are restoring a second molar, an all-gold crown may be considered. With the advent of dental implants, saving a damaged tooth is no longer the only option for preserving the health of the bone surrounding the tooth root. The implant — a tiny biocompatible, titanium screw-like artificial root — is placed in the jawbone and is then capped with a natural-looking crown of course!